If you're a man who struggles with binge eating, emotional eating, stress eating, or if you repeatedly manage to lose weight only to gain it all back, you may be approaching things with the wrong mindset. 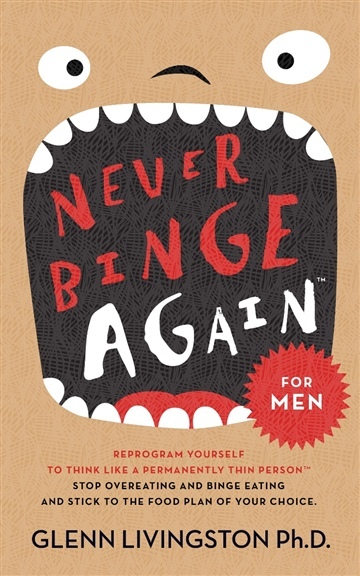 Most contemporary thought on overeating and binging focuses on healing and self-love—a very feminine approach. But men who've overcome food and weight issues often report it was more like capturing and caging a rabid dog than learning to love their inner child... Open the cage even an inch—or show that dog an ounce of fear—and it'll quickly burst out to shred your healthy eating plans, undoing all your progress in a heartbeat. From his perspective as a formerly food-obsessed psychologist—and previous consultant to major food manufacturers—Dr. Livingston shares specific techniques for isolating and permanently dis-empowering your “fat thinking self.” He reveals much of his own personal journey in the process. Free yourself from the prison of food obsession so you can enjoy a satisfying, delicious, and healthy diet for the rest of your life!